My shaving must haves / Gee Whiskers! I have incredibly sensitive skin and it makes shaving a rather uncomfortable experience at times. After shaving I battle for an entire week with itchy and sometimes very sore skin. I have tried MANY products claiming to sooth skin after shaving and many of them have been incredibly pricey. I thought I would share 3 products that work best for me, they are not only effective but also very affordable. This balm costs R55 from Rubybox's online boutique store. It's incredibly good at taking the itch and burn away after shaving. Within about 10 minutes after applying it I don't feel any discomfort or itching. It spreads easily across the skin and absorbs quickly. I also like that it does not leave any sticky feeling on my skin and it also does not have any serious smell to it. It is the only shaving cream that truly works for me because while if reduces the friction of the blades on your skin, it also soothes and heals my skin. The shaving cream is around R25 which is very affordable. 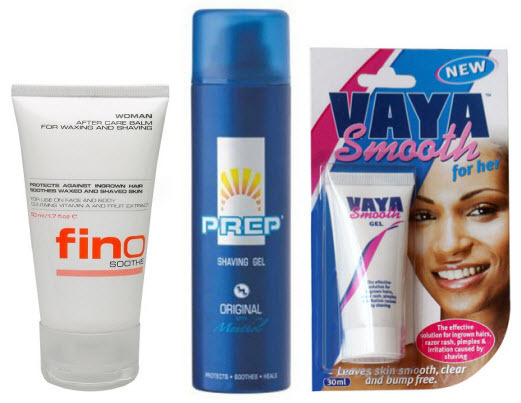 I have tried other shaving creams and gels but they don't compare to Prep. This is great gel that relieves the sting after shaving and is an absolute must for women that battle with ingrown hairs. The smell is quite strong but the gel works wonders so the smell does not bother me. It is also great to use on pimples. The gel comes in various sizes and range in price from R15 to R50. Where do you normally shop to get these products? I'm in CT and am looking for something that'll work for me... Damn sensitive skin!